Introibo Ad Altare Dei: Was Padre Pio An Ecumenist? Was Padre Pio An Ecumenist? I have never written a post on Padre Pio, whom the Vatican II sect has declared a "saint." There is so much conflicting testimony about him ( ranging from claims that he was a staunch Traditionalist, to claims he was a Modernist and a fake) that it is very confusing to know what to believe. Padre Pio, born Francesco Forgione on May 25, 1897, was a Capuchian priest ordained in 1910. It is claimed he had received numerous spiritual gifts, including bi-location and the visible wounds of Christ in his hands (called the "stigmata"). He died September 23, 1968--about four years into the creation of the Vatican II sect, which took off when "Pope" Paul VI signed the heretical document Lumen Gentium. Wotyla (John Paul the Great Apostate) "beatified" Padre Pio in 1999, and "canonized" him in 2002. I asked my spiritual father, the great Fr. Gommar DePauw (who founded the Traditionalist movement to preserve the True Faith in 1964), what he thought of Padre Pio. His reply was most interesting. Father's older brother, Fr. Adhemar DePauw, OFM, had been commissioned by Pope Pius XII in the 1950s to investigate the Capuchin in Italy. Fr. Adhemar was sworn to secrecy, and never revealed what he discovered to anyone but the pope. Fr. DePauw said that his brother never wanted to speak of him, even in those things which were of common knowledge and not related to his investigation and vow. This led Father to conclude his brother did not think highly of him. He went on to tell me that he had heard from high ranking sources at the Vatican (back in 1962, when he was a theological expert, or peritus, at Vatican II) all kinds of conflicting reports and testimonies, and he honestly did not know whom (or even what) to believe about Padre Pio. He concluded by saying, "He will never be one of my favorite so-called saints." So why a post now? I've always had misgivings about Padre Pio. I never give any credence to anti-Catholic sources, however Archbishop Pasquale Gagliardi (1859-1941), claimed that Padre Pio faked his stigmata using carbolic acid which he had purchased. The Modernist Vatican dismissed the claim, stating that the acid was used to sterilize needles that Padre used for injections against the Spanish Flu, which was raging at the time and there was a shortage of doctors. Also, there are allegations that Abp. Gagliardi was quite immoral and persecuted Padre Pio (See http://www.spirit-digest.com/Prayers/gagliardi.htm). Once again, conflicting accounts. 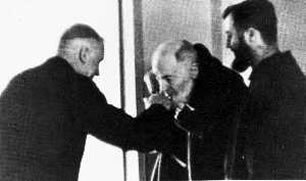 There are two opposite and believable stories about a photo where Padre is kissing Archbishop Lefebvre's ring. According to one source, he predicted the Archbishop "would divide the Church." According to other eyewitnesses, nothing of the kind was said. Pope Pius XII allowed people to visit Padre, but it was Montini the false pope ("Pope" Paul VI) who dismissed all charges against him. I have come across some information, which if true, would expose him as a non-Catholic. A reader of my blog, Mr. Frank Rega (a good and sincere man) has written a book on Padre Pio, and has great devotion to him. However, what Mr. Rega wrote on his own blog, "The Shield of Faith," would make Padre an ecumenist heretic. Since it was written by a great devotee of Padre Pio, I can't dismiss it as biased against him. What follows is the post he wrote entitled, "Padre Pio was not a rigid Traditionalist." (See http://divinefiat.blogspot.com). The title alone gave me pause. A Traditionalist is simply a true Catholic in this age of the Great Apostasy. We recognize the state of sedevacante, and reject the Vatican II Robber Council, as well as the man-made sect it spawned. Mr. Rega rejects sedevacantism, and is a "conservative" member of the Vatican II sect. Even the conservatives are infected with the heresy that you can be "Catholic in degrees." This is an outgrowth of Vatican II's heretical ecclesiology. Let's examine what was written. From "The Shield of Faith:"
The following documented cases are presented as evidence that Padre Pio believed that non-Catholics could be saved and even receive the sacraments. Most of the information for this first account comes from the English version of the book Mary Pyle, by Bonaventura MassaThis work was diligently compiled from written documents and taped oral testimonies, kept on file in the archives of Padre Pio’s friary in anticipation of the process for Miss Pyle’s Cause for Beatification. The wealthy Presbyterian, Adelaide McAlpin Pyle, was the mother of Mary Pyle, a well-known convert to Catholicism who renounced her family fortune in order to spend her life near Padre Pio. The Pyle family was related by marriage to the Rockefellers, and made their fortune in the soap and hotel business. After Adelaide found out that her daughter Mary had chosen to move to southern Italy to learn about God from a saint, curiosity impelled her to travel from her plush New York townhouse to medieval San Giovanni Rotondo, in order to meet this holy man. Now you might be thinking that maybe she converted secretly (known but to God) on her deathbed, and so died as a Catholic. Nothing wrong (or heretical) with that--everyone should pray for such wonderful conversions. But what is written next expressly denies this is what happened or what Padre Pio meant. This is sheer heresy, for no one outside the One True Church can be saved, nor can non-Catholics be given the sacraments. There are two more scenarios given: Padre Pio asks people to pray for a soul about to appear before God. That soul turns out to be the Anglican King George. He does not pray for his conversion. According to "The Shield of Faith," However, it is not recorded or implied that he asked his confreres to pray for the deathbed conversion of the king – an important intention that Padre Pio in all likelihood would have explicitly stated, if such were his purpose. Although he mentioned the king to his priest colleague, he did not tell the friends in his room that they were praying for a non-Catholic until they had finished their prayers. One cannot therefore say that it is to be assumed that as Catholics they were praying for the king’s conversion...Of course this scenario would not be acceptable to one who holds that Padre Pio subscribed to a literal extra ecclesiam nulla salus position. Those who hold that position are left with the unlikely alternative that they were praying for a Catholic, and that Padre Pio had requested the prayers because he was given a private revelation that King George V of England was secretly a Roman Catholic, loyal to the Pope! Finally, there is this scenario about a Jew, Julius Fine, whom Padre Pio claimed was saved, but Padre never mentioned Baptism of Desire, or that Mr. Fine had converted to to the Faith. Mr. Rega concludes, His ingenuous openness to the plenitude of God’s mercy anticipated the explicit declarations of the Church during and after the Second Vatican Council on the possibility that non-Catholic churches can be a "means of salvation," and on the reception by non-Catholics of the sacraments in certain cases. Padre Pio actually believed that the gospel of Jesus Christ was Good News! Heresy is never "good news." According to theologian Tanquerey, "Outside the Church there is no salvation...Whoever culpably remains outside the Church to the end of life cannot be saved; he is culpable who does not seek the truth when he is in serious doubt, and, a fortiori, he is culpable who knowingly and willingly does not enter the Church when he recognizes it as true...Whoever inculpably remains outside the Church can be saved provided he belong to the Church through faith and charity, or perfect contrition " (Dogmatic Theology 1:138-139; Emphasis mine). "There is one universal Church of the faithful, outside of which no one at all can be saved." Pope Innocent III, ex cathedra, (Fourth Lateran Council, 1215). 2) The Sacraments may not be given to non-Catholics. "It is forbidden that the Sacraments of the Church be ministered to heretics and schismatics, even if they ask for them and are in good faith, unless beforehand, rejecting their errors, they are reconciled with the Church." "In the case of those [non-Catholics] who are in good health, the prohibition [to receive the sacraments] is absolute; no dispute on this point is possible in view of the repeated explicit declarations of the Holy Office." [e.g. decree of Aug. 28, 1669]. Padre Pio remains an enigma. Is it possible that Mr. Rega simply interpreted the actions of Padre incorrectly, or that the sources are flawed? Perhaps. If what he states about Padre Pio is true, then he was not a Catholic, but a heretic. If he thought there is salvation apart from the Church so that non-Catholics--as non-Catholics---can be saved, that is heretical and false. If he intended to give the sacrament of Confession to a non-Catholic who simply wished to confess without rejecting her errors, that is a grave sacrilege; and if he believed there was nothing wrong with this, he is heretical. I always felt something remiss about Padre Pio. He accepted the wicked Montini as "pope" yet allegedly had such great spiritual gifts of discernment. What makes me most skeptical is his adulation by the Vatican II sect and his "canonization" by the wicked Wotyla. Mr. Rega's explanation of these words and actions by Padre Pio would go a long way in making sense of it. He would be an ecumenist just like them. I hope Mr. Rega, a good man, will now see the errors of the Vatican II sect and convert. Yes, I will pray for his conversion, because to be "partially Catholic" means to be totally lost. The modernists and Thier fellow travelers would do all that they could at that time to discredit and muddy the waters about Padre Pio if he were a real Saint. I don't think we will know until the last day. I will withhold my judgement on any writings about him by other people as they could be all lies. David this comment makes no sense. On the contrary the modernists have done everything they could do to promote and canonize him. The fact that they have and continue to use this man to push their modernist agenda should tell you something about him. Never mind David, I misread your post. Sorry. Actually Father Benedict Hughes (CMRI) had some talks on this issue. Modernist always tells half truth. "Pope" John Paul II "beatified" Pope Pius IX, and the purpose was to clear many controversies and oppositions on "beatifying" "Pope" John XXIII (by himself) and later "beatifying" "Pope" Paul VI (by "Pope" Francis). I must agree that there is so much confusion here we may not know for certain about Padre in this earthly life. Introibo, I'm glad you had the courage to publish this post about a man many believe to be a saint. I had some commments about this man, whom I believe was a fake, in one of your earlier posts. None of these stories recounted here are new to me. I first read these same "ecumenical" passages many years ago on a post against the Dimond Brothers, who at the time had been selling their own little booklet on Padre Pio in order to support their makeshift theology. I'm afraid I do not recall the source anymore, but soon after I read these passages, I forwarded the blog posts to the Dimond frauds, challenging them to respond to or at least assume a more prudent position on the padre in light of these published ecumenical assertions. Well, the Dimonds do not usually respond to people who contradict and refute them. Anyways, other information has since surfaced on Padre Pio's usage of carbolic acid. That, and the fact that there are exactly zero photographs of the man's stigmata that in any way depicts clear cut holes through the hand were enough for me to make the call. I believe he was either a heretic, a fraud, or both. Whatever the case may be, I don't need him to save my soul. Your last line says it all. We must be careful whom we emulate. There's just so much doubt on every point about him. I always follow where the evidence leads; even when it's uncomfortable for me or unpopular to do so. I'll agree with Fr DePauw, "He'll never be one of my favorite so-called saints." I agree with every point of your post. I think the crux of this subject is whether the claim of Reda is true or not. I am not familiar with Reda and his opinions. I am not sure his belief on the EENS dogma, and how is his view on Traditionalism. If he is not a fan of Traditionalism and does not believe in the EENS dogma, then as he is a devotee of Padre Pio, he will either intentionally or unintentionally twist the FACT. Another example is I recently saw, is some V2-NO followers, both Left and Right, Liberal and Conservative, claim that Pope Leo XIII does not agree with the opposition to Ecumenism, because he called Protestants the "separated brethren" many times, plus some claims. I'm always glad to hear from my readers! I agree with your comment. For the record, Mr. Rega is open to Traditionalism, and has contemplated sedevacantism on his blog. He also refuses to read Siscoe and Salza's 700 pg "refutation" of sedevacantism. I'm not sure if his devotion to Padre has led him to accept those V2 errors, or if he is in error and Padre can be seen as endorsing them. In either case, let's pray he sees the light!! I have no particular devotion to Padre Pio, but there are some difficulties with the suggestion he was a fake. First of all, it seems to be not a very difficult thing to prove whether or not the stigmata were genuine, or at least not self-inflicted. Therefore, I ask, is it plausible that Pius XII had an investigation carried out and did not investigate the stigmata? And if he did investigate the stigmata and found out they were bogus, is it possible that he would have not made this information public, in order that the faithful be no longer deceived by a fraud? What's more, I've read that Padre Pio had been investigated, not just once, but many times by both Pius XI and Pius XII, as well as by his own order. Therefore, I'm strongly doubt that, if he were a fake, he could have avoided detection and exposure by the Church authorities for all that time. As for his alleged unorthodox statements, they are indeed troubling. If Padre Pio said those things, he was not Catholic. But are we sure that Mr. Rega's sources are reliable? Remember, the modernist authorities would have had a great interest in having people believe that Padre Pio was an ecumenist just like them. I agree with you George. You bring up the strong points in favor of Padre. The problem could be in the source. I have to check a citation given to me by a Traditionalist follower on my Twitter account. The archbishop who claimed Padre was a fraud allegedly resigned his bishopric after it was revealed he was a child predator. ("They didn't become bums overnight" as Fr DePauw would say.) I don't know if it's true yet--but as I said in reply to him ---there is just so much confusion we may never know the truth about him in this life. Maybe he was a great Saint. Maybe not. All we can do is present the evidence as best possible. I would caution anyone against using Padre Pio to "prove" anything. He and Mother Teresa are often invoked by the Vatican II sect as proof of their legitimacy. We have solid theology on our side, and do not require approval from the alleged words or actions of Padre Pio. You seem to suggest that ONLY the miraculous would convert you. Two of the greatest miracles was creation out of nothing (ex nihil) from the Big Bang, and the Resurrection of Christ from the dead. I also suggest you look into the Eucharistic miracle of Lanciano, which has been extensively examined. So too, many miracles as the result of the intercession of the saints pre-Vatican II. To Anonymous at 12:53, I wanted to comment on your statement that there is no proof that Padre Pio had the stigmata. Actually, he was examined by numerous doctors, who just about unanimously agreed that his wounds were not artificially- or self-inflicted. I believe the documents of their reports are publicly available. To Mr Introibo, I think this is a very interesting post, especially about the rather indirect personal knowledge you have about Padre Pio. I don't know this priest who investigated him, but isn't it plausible that a priest sworn to secrecy, who took his duty seriously, would be uncomfortable talking about the case at all for fear that he would accidentally reveal secret information? If this involvement he had was similar to the seal of confession, then I think it's completely understandable -- admirable, in fact -- that he make no comment at all about the man, since people might assume those comments were partially based on privileged information. That being said, these anecdotes you tell are disturbing, to say the least, but I'm not completely convinced they're true. The modernists couldn't completely make him disappear. He was too famous. So wouldn't it be a logical second best to spread stories that make him look like one of them? As far as I know, he never said the new Mass. It's easy to wonder why he didn't publicly denounce Paul 6, but first of all we can't assume God would have revealed to him that he was an antipope, and secondly we don't know how much he knew about what was going on in the world and the Church, or what his wicked superiors allowed him to hear or to tell people. I did hear that his superiors sacrilegiously bugged his confessional, which I can well believe. Anyway, thank you for this very interesting post, as usual. And happy new year! Thank you my friend, Happy New Year to you as well! I agree with you that there are strong arguments on both sides. Your assessment of Fr Adhemar could be correct. I'm not disagreeing with either side of the debate, just putting the controversy out there and letting each person decide what to believe regarding Padre Pio. The evidence suggests staying away from Padre Pio until further solid evidence is revealed. The SSPX & Novus Ordo types talk about and rely upon Fatima MUCH TOO MUCH!! This I can say for certain! Look at their websites & blogs,its not a secret. These people act like Fatima is the Holy Bible & part of the deposit of Faith. We would do well to remember (as I have written in the past), that private revelations (even those with Church approval) are not required to be believed. I believe in Fatima, but I refuse to get caught up in arguing over "the true meaning" of what was allegedly said. I keep the First Saturday devotion as far as I can, pray the Rosary daily, and wear the Five Fold Scapular. We must believe and act upon what the Church teaches about the Deposit of Faith through Her approved theologians (something SSPX types try to avoid as it destroys their position). We don't need private revelations to attain salvation. Padre Pio was one of the first saints I came into contact with when I was converted from Calvinism to true faith. I saw a video in which a very famous "priest" Novus Ordo here in Brazil, Paulo Ricardo, spoke of his impressive miracles. He did not see such a thing where he was, and he was kind of fed up with Protestantism. And that was one of the minor facts that made me go to the Una Sancta Ecclesia. But I soon learned that this same "priest" is a sophist at the Ratzinger School of Hermeneutic of Continuity and I turned away from that. Since then I have become a traditionalist and soon after a sedevacantista. If these words are from Padre Pio, then he is but a heretic, and there is no supposed miracle that I provide otherwise! I have no particular devotion for this priest, and by the way I will not have it because of doubt. Obs: By the way, have you talked about the hermeneutics of continuity? Introibo, happy new year for you and your family! God bless you! Happy New Year and God Bless you and your family, my friend! God bless you Junior Ribeiro and may the Lord Jesus bless your loved ones. A citation has been brought to my attention which required me in conscience (and as the accurate research/writer I try to be), to revise that portion of my blog wherein I call Archbishop Gagliardi "a very Catholic source." The citation (http://www.spirit-digest.com/Prayers/gagliardi.htm)alleges, inter alia, that the Archbishop was accused of sexual molestation and other crimes. However, even this citation is not without it's own problems. For example, it states, "The archbishop's personality apparently engendered strong bias and dislike -- making it difficult, especially so many years after, to know exactly which charges to believe. Moreover, this is not to judge; we have no idea how God viewed the Manfredonia archbishop, who was surely possessed of certain good qualities and had been elevated to the archepiscopate at the age of 38 by no less than Pope Leo XIII (who will rank in the pantheon of popes alongside the likes of Gregory the Great and John Paul II). " The source itself claims they don't know "which charges to believe," and they equate Pope St. Gregory the Great with John Paul the Great Apostate! Once more, doubt upon doubt, with nothing left but confusion. To be fair, I placed the citation next to where I discuss the Archbishop and will allow my readers to discern for themselves. I knew this post would be quite controversial. Traditionalists often have strong feelings about Padre Pio one way or the other. Like my spiritual father, Fr. DePauw, I'm "agnostic" on Padre Pio. He might be a great saint, then again, he might not. His "canonization" by Wotyla (JPII) is no assurance of sanctity, that's for certain. My post is carefully worded "WHICH IF TRUE"--I'm not conceding that Mr. Rega's sources are veridical. I'm exploring the possibility that if they are true, Padre Pio was not a saint. The stories were written by a level-headed man (Mr. Rega) not given to sensationalism, so they need to be evaluated accordingly. He says that it "proves" non-Catholics can be saved and receive the Sacraments. This is heresy, and I hope Mr. Rega leaves the Vatican II sect. All of this goes to the crux of my article--WAS Padre Pio an ecumenist. I don't know. Personally, I don't feel comfortable about him with all the conflicting reports from so many sources (and many highly credible ones at that). He has been used (right or wrong)to "prove" the legitimacy of Vatican II, Feeneyism (Dimond "Brothers" in days past),among a host of other topics including ecumenism. This is the danger. In this time of the Great Apostasy, we have no assurance of his sanctity and we should not believe or refuse to believe something based on his alleged words/deeds. Rather, let the teaching of the Church, not alleged saints, seers or apparitions be our guide as True Catholics. I do not claim (nor have I ever claimed) to be a theologian, or some infallible guide. I most certainly am not. What I am is a Traditionalist Catholic who loves the One True Church of Christ, and feels called to expose the false sect of Vatican II, while warning people of dangers to their souls, and better inform the of Church teaching. I do this using my knowledge acquired from Fr. DePauw, as well as my education and experience in writing and research. I only ask that God uses me as His servant, and whatever good may come of this blog, the credit is all His. I am always open to fraternal correction, as you can see. I want to put all the info out there to be fair to all sides on a contentious and confusing issue. So, the bottom line: I adopt the position of Fr. DePauw about Padre Pio; I don't know who or what to believe. He will never be one of my favorite "saints." This is completely false. How can you fall for this nonsense? The modernists tried to hide him when he was alive especailly during the 1920s and couldn't do it. So now that a significant portion of Italy has parents or grandparents that personally witnessed miracles or went to confession to Padre Pio only for him to accuartely read their souls, the modernist try to make him out to be one of them and put words in his mouth he never said. My father served Mass several times for him in 1967 and went to confession to him. Padre Pio was the furthest thing from an Ecumenist! There is even a recent lie going around that I just heard that he supposedly joked that there are "3 Gods". These lies are coming out for the first time 40 to 50 years after he died. Isn't that suspicous? Yes. Read what I wrote directly above. In 1967 why didn't he expose Montini ("Pope" Paul VI) as the fraud he was, and denounce Vatican II? This is where a whole bunch of conspiracy theories come up (some possibly true), but it takes me back to what I wrote above; I don't know who or what to believe about him. Luckily, our salvation does not depend upon him. I cannot answer for sure why he did not expose Montini. What I know is that his eyesight was very poor at the end of his life and the Missal he used at Mass had extremely large font. It is therefore probable that he was not reading much in the late 1960s and might not have even read any Vatican II documents. He also was not giving sermons so he would not have committed on them from the pulpit. He was spending most of his day in the confessional. When I have more time, which is not going to be any time soon, I will provide more information from my father, who was living in Rome and would spend a few weeks during the summer in San Giovanni Rotondo; he also knew some of the friars that were taking care of Padre Pio. When I figure out where I want to post this information I will attach photographs of him and Padre Pio including one of him serving Mass for Padre Pio. But you don’t have to wait for any of that. Ask some Sedevacantist in Italy if they personally know people in their own family who were cured by Padre Pio or who had help from Padre Pio in remembering sins to confess in confession. There are a lot more people than you might expect, especially in the Province of Foggia. Lastly, why publish something with the suggestion that he could be an Ecumenist when you know the source is not fully reliable? Would it not be more prudent to avoid throwing out such a vicious accusation, unless there was solid proof? The accusation comes from a good person badly misled. If Mr. Rega sees the error of Vatican II, that makes the post worthwhile. "Salus animarim suprema lex." "The Salvation of Souls is the Supreme Law." My purpose is to show the confusion surrounding this man and prevent people from adopting beliefs based on what was allegedly said or done by him. You've made a perfect case in point. You seem to think that the miraculous is proof positive of orthodoxy. Not so. Did not our Lord Himself say, "Many will say to me in that day: Lord, Lord, have not we prophesied in thy name, and cast out devils in thy name, and done many miracles in thy name? And then will I profess unto them, I never knew you: depart from me, you that work iniquity. " The stigmata and other seeming miraculous events can be if diabolical origin. I'm NOT SAYING THAT WAS DEFINITELY THE CASE WITH PADRE PIO. But in the absence of a true pope, who can really canonize, we can't make the definitive call. If these allegations are true, it would prove the miracles to be false. I'm telling people to stay out of the trap of doing or believing things based on private revelations and/or people alleged to be holy---stick to Church teaching. This applies most of all today with no Magisterium to pronounce true saints and miracles. After the VII volcano which poisoned the spiritual minds of the populace, any elevated personalities are best treated with mercy/caution. Celebrity VII'saints' or 'venerables'... why risk it? We know Montini, Wojtyla, to name a couple, along with an OD (opus 'dei') list that could sour milk in a second) are lies. Simple if you have a wit of Catholic faith. From the True Faith, we have a sure assembly of Saints with not a taint of Modernism to ask for prays - this is Grace. Why reject it for the sake of being contemporary when contemporary has the shelf life of a fly. I would suggest reading the testimony of Father Luigi Villa regarding Padre Pio. Read also the magazine Chiesa Viva which he published. Fr. Villa is a strong argument in favor of Padre. I have a devotion to Padre Pio and I have a picture of him on my wall and also another small holy card of him on my wall. But I was reading about him and I had to stop because there were heresies in the writings attributed to Padre Pio. I do not know if they were really from Padre Pio or if they were lies of the modernists. Remember since Padre Pio lived after Vatican II, the books about him are mostly written by modernist heretics so they are not trustworthy. So I do not know what to think about him. There is evidence of many miracles attributed to Padre Pio's intercession so that is evidence in his favor, though I guess it is possible that they were not miracles but were only tricks of the Devil. It's sad but there's no assurance of his sanctity in the absence of a true pope. The interesting thing is hearing about Padre Pio's warnings about freemasonry invading the church. It has been told he converted a freemason who went back to the lodge and announced his conversion. This could explain all the stories told about him that were supposedly not true - could have been freemasons trying to get him out of the way? Either way, I do believe the freemason's may have "given up" in the early days of Vatican II and decided to do a Padre Pio makeover, by creating a new version of him by publicizing untrue, but palatable stories about him - stories that led people to believe Padre Pio would approve of the Vatican II changes. How can you rely on the word of people associated with the Rockefellers? After the Rothschilds, that family must be the top-ranking one in the New World Order. They push usury, fiat money, exploitative capitalism, population control, and global government. If those Pyle women really existed and met Padre Pio, they were obviously sent in to discredit him. Alternately, Rega may be making all that up. Do you have any evidence that Padre Pio ever PUBLICLY uttered heresy? Does any conclusive documentation exist of Padre Pio espousing heresy? I do not think that Archbishop Pasquale Gagliardi is a credible source. Saints have always been persecuted. Some of the saints have been persecuted by true clergy. I see hearsay not heresy. In times where there have been popes and antipopes reigning at the same time, such as the Great Western Schism, saints have been confused about who the true pope is. God obviously did not choose to reveal to Padre Pio that Montini was an antipope. You knock the sources, yet cite Theresa Benns, the once again Home Aloner who staged the “farmhouse conclave” which “elected” David Bawden as “Pope” Michael. As a spiritual son of Fr DePauw, and I knew him very well for decades—he was the most ANTI-MASONIC priest you’d ever want to meet. As far as Padre Pio is concerned, please note that this post poses a question, but does not answer it. He may very well be a saint. However, re-read what I wrote. This priest was alleged to have the ability of bi-location, could “read the sins” of penitents, yet could not detect Montini? Fr DePauw never claimed to have such gifts—big difference. Fr DePauw also (since at least 1999) adopted the sede position. He did not mention Wojtyla in the Canon and never referred to him as pope. Again, Padre Pio COULD be a saint. One thing is certain; his “canonization” by Wojtyla is no proof of sanctity! !